Just after I finished making a big batch of this dough, my heart sank. My family won’t like cookies with ginger and ohmygosh cloves. But the dough was ready, and I wasn’t going to throw it out. So I sat and shaped the cookies, all the while thinking about how nobody would eat them. It’s a good thing I’m not a betting sort of woman, because I’d have lost big time. My little brother (notoriously unadventurous in the palate department) took one look at the cookies and said “Oh, yay! Snickerdoodles.” His mistake is understandable. They look a bit like snickerdoodles, with the crackly top and the sugar topping. But my tasters bit into the cookies, and far from the looks of horror I had expected, they were fighting over them-down to the last crumb! In the bowl of your mixer, cream the butter and sugar until light and fluffy. Add the eggs, molasses, baking soda, salt and spices, scraping down the sides to incorporate everything evenly. Stir in the flour. Cover and refrigerate for an hour, to make the handling easier. Preheat oven to 350. Grease two cookie sheets. Shape the dough into 1 1/2 inch balls (approximately a tablespoon.) Roll the ball in sugar to coat, then place carefully on baking sheet. Leave 2 inches between cookies to allow for spreading. Bake the cookies for 10 minutes. The cookies may not look completely done, but take them out anyway, they set as they cool. Allow to cool four 10 minutes on cookie sheet before transferring to a rack to cool completely. Yum. This recipe sounds scrumptious. I haven’t made ginger cookies in such a long time. I am going to have to change that asap and try this recipe. Thanks for sharing! Thanks for stopping by! Please let me know how you like them. I love ginger snaps! Can you use ground ginger? Sure can! That’s what the recipe calls for. These are chewy- make sure that’s what you’re looking for. Also, do I bake the balls of dough into cookies or do I flatten the balls at all? I’m going out shopping now to get some molasses. These cookies look delicious! Thanks for pointing that out, I fixed it. No need to flatten the balls of dough! do you think this recipe would work with agave nectar instead of the molasses? Thats what I have in my house 🙂 also, do you think the cloves can be omitted? 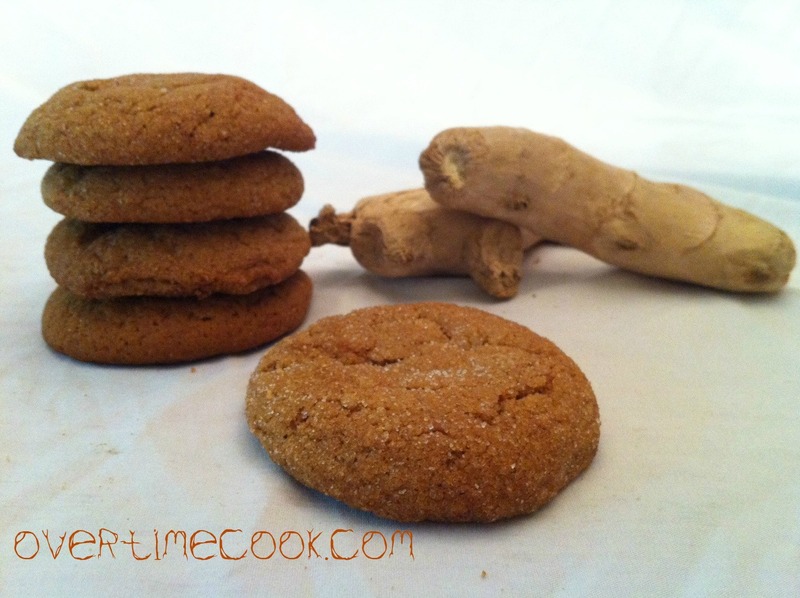 I have to try the molasses ginger cookies and the healthy ruggies!